Is anyone still looking for a fun dish to bring to a super bowl party? Do you want to impress the heck out of other guests? 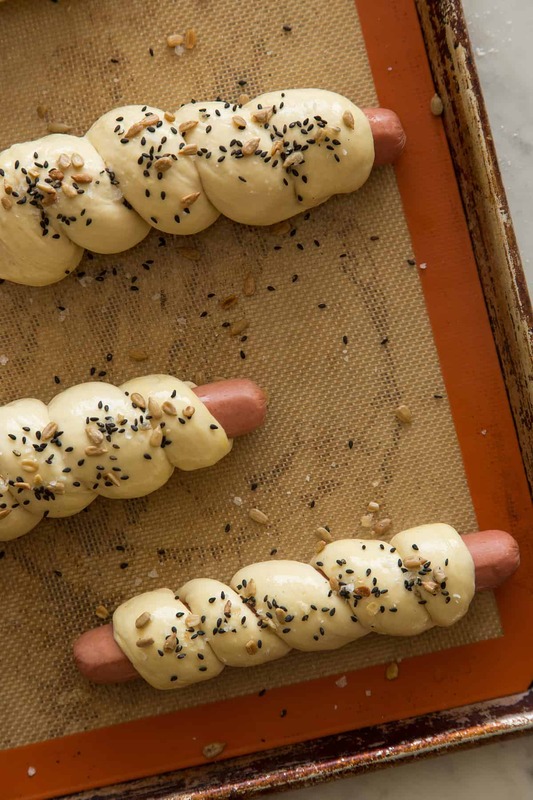 Then make these pretzel dogs…seriously. As “bread” making goes, this pretzel recipe is pretty basic and simple, but results in awesome pretzels with perfectly soft and chewy texture. Today we have a recipe I am so excited about. Another one for game day, or just any day. 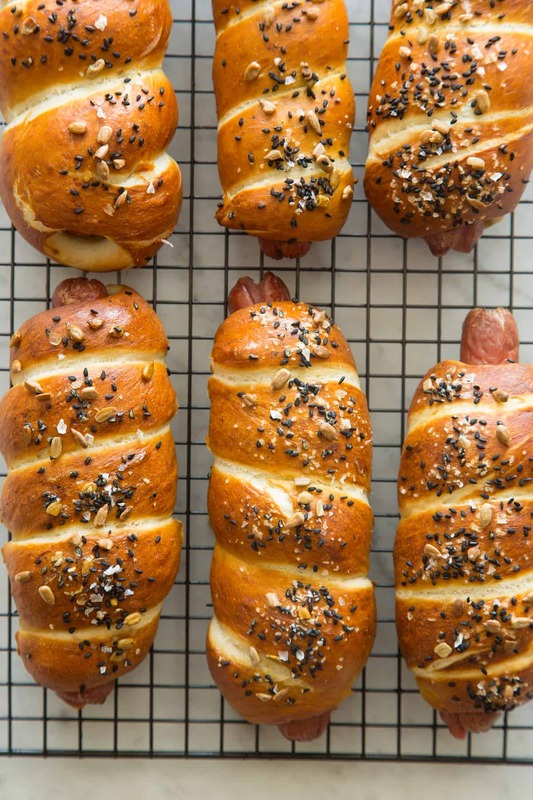 Pretzel dogs. WITH, WITH! A mustard-cheese dipping sauce. Oh yea! The king of all hot dog situations. YES. This is a favorite for sure. The mustard cheese dipping sauce is perfection, and the pretzel dough is also just perfect, not too dense, with a nice crust. Yum. This is such a more fun / prettier / yummier take on traditional grilled or whatever hot dogs for game day. The pretzel portion of the recipe is actually from our new book The Perfect Egg. Eggs may not generally find their way into pretzels, but we added one into our recipe because we love how it lightens the overall texture. If you have yet to pre order, please do! We worked so dang hard on this book and we are so in love with it. 2. Stir the egg, butter and salt into the proofed yeast. Then stir in the 41/4 cups of the 1 cup at a time, continuing to stir until the dough comes together in a rough mass. 3. Lightly flour a work surface and turn the dough out onto it. Knead the dough, adding more flour as needed to prevent dough from sticking to the surface, for 8 to 10 minutes, until the dough is smooth, soft, and elastic. 4. Shape the dough into a ball.and place into a lightly greased mixing bowl. Cover with a clean, damp towel and place in a warm area until dough doubled in size, about 1 hour. 5. Preheat oven to 400˚F.Line 2 baking sheets with parchment paper. 6. Punch the dough to release the air and cut the dough into 10 equal pieces. 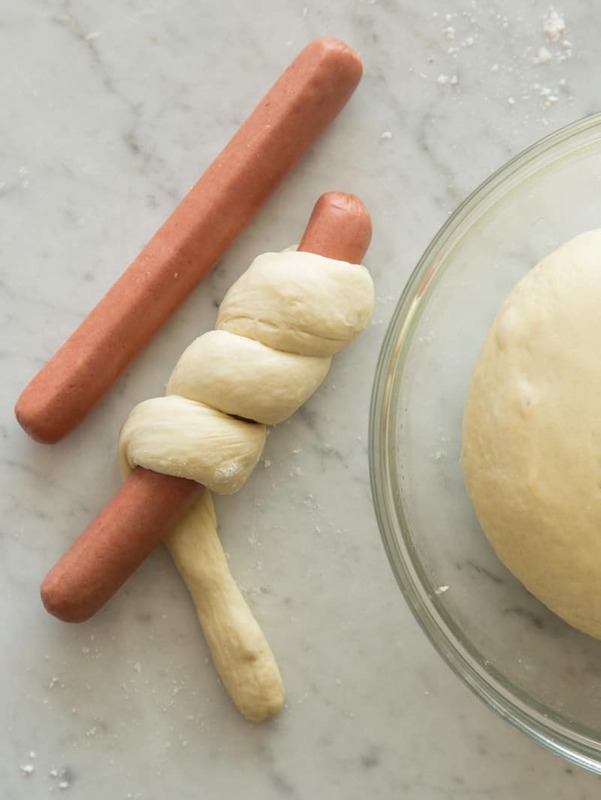 Working with 1 piece at a time, roll the dough into a rope 12-16 inches long, then wrap the rope around a hot dog, leaving a 1/2 inch on each end exposed, and pinch the dough on each end to seal. 7. Combine the water and baking soda in a deep stockpot and bring to a boil over high heat. One at a time, dip the pretzel-dogs into the boiling water for about 30 seconds, then carefully return them to the baking sheets. 8. Generously brush the pretzels with the egg wash and sprinkle with the black sesame seeds, sunflower seeds and sea salt. 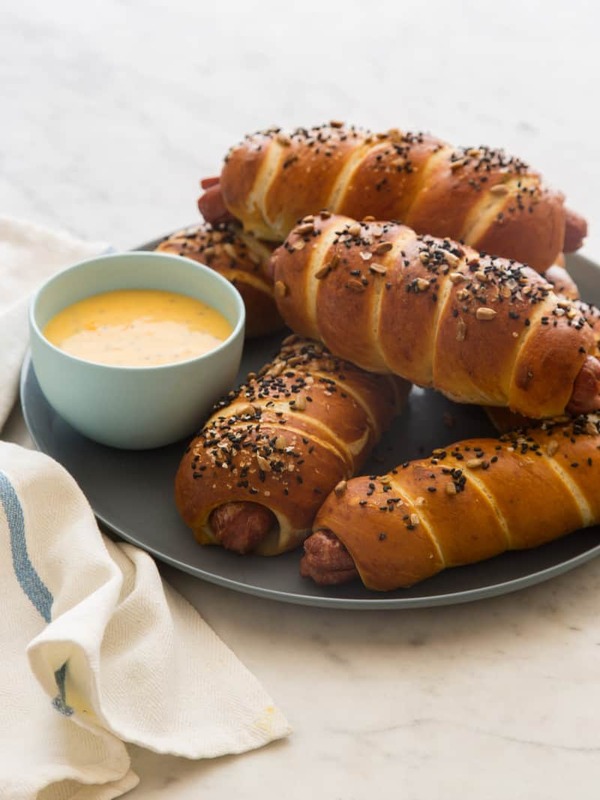 Bake the pretzel-dogs for 16 to 18 minutes, until they are golden brown. Transfer the pretzels to a wire rack and let cool for at least 10 minutes before serving. 9. Cheese sauce: Melt butter in a small pot over medium heat. Add flour and whisk together for 2 minutes. Stir in milk and continue to whisk for 2 to 3 minutes or until mixture is smooth. Add mustard and cheese and whisk together until smooth. 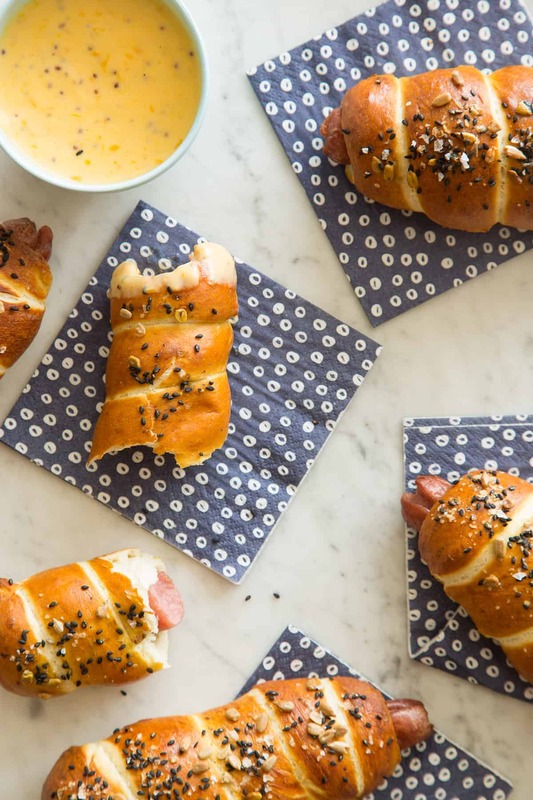 Season with salt and pepper and serve immediately with pretzel dogs. Omg, the boyfriend is going to LOVE these! I think I have my Superbowl treat now! How much flour do you add to the butter for the cheese sauce? 2 tablespoons! I accidentally left that out! Will be added shortly! oops. amount of flour is not listed for cheese sauce, only mentioned in method. I would guess 2 T, but it’s just a guess. sounds very tasty, I will be trying it soon. You’re totally right! Just forgot to add that, i guess! This looks so delicious – I love the sound of adding egg to the pretzel! tasty! These look so good! I have a major weakness for hotdogs. Whenever I find a reasonably healthy version, I jump at the opportunity to make some sort of dinner out of them. I have been on a major pretzel making kick lately. I can’t wait to give these a shot, it just screams spring! This looks amazing! If I want to make this into pigs in a blanket, how will that affect cook time/recipe? Thanks so much! looks yum!! How long should you let it rise for the first time? Just one question: does the dough have to rest/rise after the kneading? Thiiiiiis has me all weak. These sound amazing! I really wish I had some now. Made these last night. They were amazing! We used smoked sausages as they have a bit more substance than a hot dog, and the texture of the pretzel was a perfect match. We’ll be making these again. Thanks for the great recipe! Hi, These look great! I just wanted to mention that you might want to add the ingredient “Hot Dogs” to the recipe and printed recipe. We were just making the grocery list for these and realized it wasn’t there. Thanks and can’t wait to try them! Only 2 tbs of milk? Doesn’t seem like enough. You’re correct! Thanks for catching that! You do not need football to enjoy these. I am going to make them with merguez. Hi! If I don’t have bread flour, will all-purpose flour do? Oh wow this looks so yummy! I would eat them all if all made them!! I made this for dinner tonight and they turned out beautifully. It was a significantly easier pretzel dough recipe than the one I had been using previously, with better and softer results. Wonderful. Any tips for freezing and reheating? Thinking about making a batch and freezing them after the boiling step. When ready to heat again, brushing with egg wash and adding toppings. Would you recommend fully thawing or how much time to cook from frozen? Nope, I would stick them in the oven completely frozen and just make sure to bake them for a longer amount of time! I found it easier to add the sesame seeds, poppy seeds and dehydrated onion on the inside before putting into the water to boil. On re-heating frozen ones just take them out of the freezer about an hour before you are ready to eat. Then microwave them on defrost for a couple of minutes.